Since the birth of the fashion blog, the relentless pace which a blogger had to churn out new content created an aura of a limitless wardrobe with a deep bank account to support it. Parlaying a variety of styles, the Anna Dello Russos of the blogosphere were not bound to a specific look but preached the democratization of fashion and creativity not limited by cost. However, mindless consumption without thought of the negative social and ecological impact on the world created a backlash of minimalist bloggers. Focusing on the capsule wardrobe, authentically consistent style and the insistence of perfection before any purchase, they encourage their readers to think twice before walking into Zara. With a heavy stress on mixing and matching, the content is often text heavy (a big welcome and refresher if you’re an avid reader) and show off already-featured garments in heavy rotation. While outfit posts are relatively rare compared to most self-style bloggers, the photos are characterized by headless/anonymous shots to stress on the garments and not on the blogger his or herself. The Minimalist blogger subscribes to the philosophy that less is more. Putting herself on a diet from fast fashion and synthetic fabrics, the Minimalist blogger rejects the concept of trend buying in favor of buying pieces that will increase cost-per-use (CPU) and longevity. The signature minimalist look has a strong root in the French 5 Piece Wardrobe. The look is rather unisex characterized by Breton stripe tops, dark rinse jeans, Isabel Marant boots, mannish coats, boxy dress shirts and white T-shirts. Usually executed in a collage, Polyvore format, the minimalist blogger often posts a variation of a single sweater or boot focusing on the details and cut of the garment. This facilitates an avid discussion of their reader’s personal experiences with the longevity and quality of the piece. Often going beyond images, the Minimalists share articles on the perfect wardrobe and discuss about issues revolving around consumption habits and weighs in on the sustainable and moral facets of our individual purchasing power. While many readers may welcome a polar opposite viewpoint on how to shop, there is the danger of people using it as an excuse to chuck out half their closet only replace it with stripes and Isabel Marant dicker boots. Conformity without customizing the philosophy of minimalism to an individual’s unique taste will only result in a closet without character. 1. Simply stop buying for a month. This will allow you to see what you naturally deviate to and feel most comfortable wearing instead of that new item you just bought. This is your true style that you should flesh out. 2. Create a capsule wardrobe of items you love to wear the most and study the cut and colors that you find most flattering for your body type and taste. 3. Instead of immediately emptying out your closet and donating it, find new ways to wear pieces you forgot about to up your CPU. 4. Trust your creativity to create new outfits out of old garments and not on your power to sniff out a good sale or thrift item. You have enough clothes. 5. Lastly find pieces that you want to put into your foundation wardrobe seeking variations of those desired items at different price points and brands that offer quality. Calculate how much you spend a month on clothes to figure out how to obtain those pieces. The idea is to avoid impulse buying, refining your personal style and spending more on quality while purchasing less clothes. You've got so many good points here! For Halloween, I basically used clothes I would wear multiple times. :3 Yeah, for one, closets don't expand and stretch in this world. Thanks. Fantastic blog. This is definitely my style philosophy. I don't spend money on clothes monthly. I spend seasonally, when necessary. My wardrobe is mostly American Apparel, as it is both a local and socially responsible company. I have banned anything made in a sweat shop from my wardrobe. Also, quality over quantity is my motto. I am loving your posts now, Sam! Very informative, looking forward to your future posts : ). I'm now addicted to Assembled Hazardly - I'm a huge sucker for blogs that have quality writing. 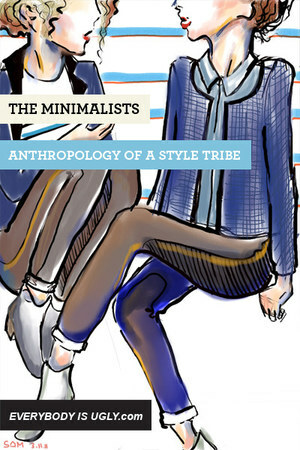 I'm one to learn towards the "minimal style" blogs when I'm looking for a good read. All the "trademarks" you talked about are definitely what drive me to bookmark the blog. Great post Sam! these are great tips and a great intro to a niche i didn't even realize existed! This is basically a written form of my fashion philosophy- I have tight money constraints and rarely buy new clothes, but I know how each new item will mesh with my closet. I've also gotten good at revamping old items with a little sewing know-how. Thank you for this! A minimalist is a Spartian.Whatever that means.Great!